After a short while im here again with another wonderful recipe that all non veg lovers enjoy to the fullest. It calls for a number of ingredients and definitely a long process when compared to the normal biryani that is made in cooker or some vessel where rice is cooked along with chicken. Take the whole spices and grind it to a coarse powder. Chop mint and coriander leaves, slit green chillis, and keep all other ingredients ready for marination. Wash the chicken well and let them be big pieces. The below ingredients are for layering. Slice thinly two big onions and deep fry in oil and brown them nicely. Keep some Julienned ginger and chopped mint and ghee/butter ready. Mix all the ingredients mentioned for marination with washed chicken. Add 2 -3 tbsp of oil to it and set aside. Let it marinate for minimum 3 - 4 hours. you can also keep it overnight in fridge. 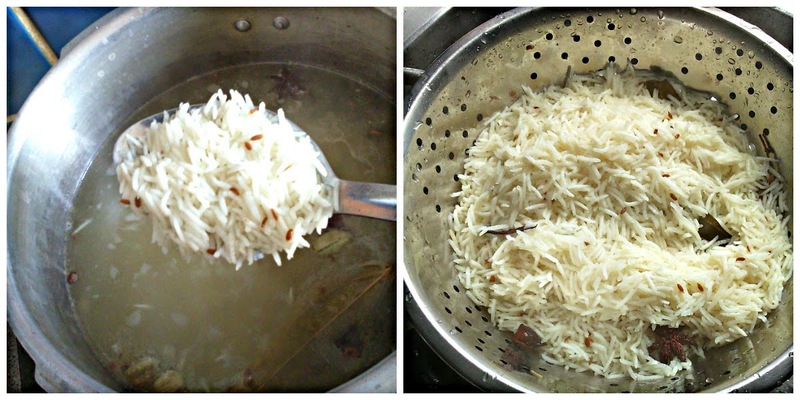 Wash basmati rice and soak it for minimum 30 minutes. After putting the rice in hot water, take a big stockpot or any heavy bottomed vessel and spread the marinated chicken in it. Remember to check the rice once. In Kachi method, the raw marinated chicken is layered at the bottom and then topped up with partially cookled rice and other stuff like ghee, mint etc. Soaked basmati rice cooks really fast , so keep an eye and we don't need fully cooked rice. When the rice is 60 % cooked remove from stove and drain it in a colander. Spread some brown onions on the chicken. Spread half of the semi cooked rice on the chicken. Sprinkle some mint leaves, ginger and brown onions. Spread a tbsp of ghee/butter (optional). Now spread the remaining rice and again add the remaining onions, mint leaves,ginger and butter. Sprinkle the saffron milk on the rice. 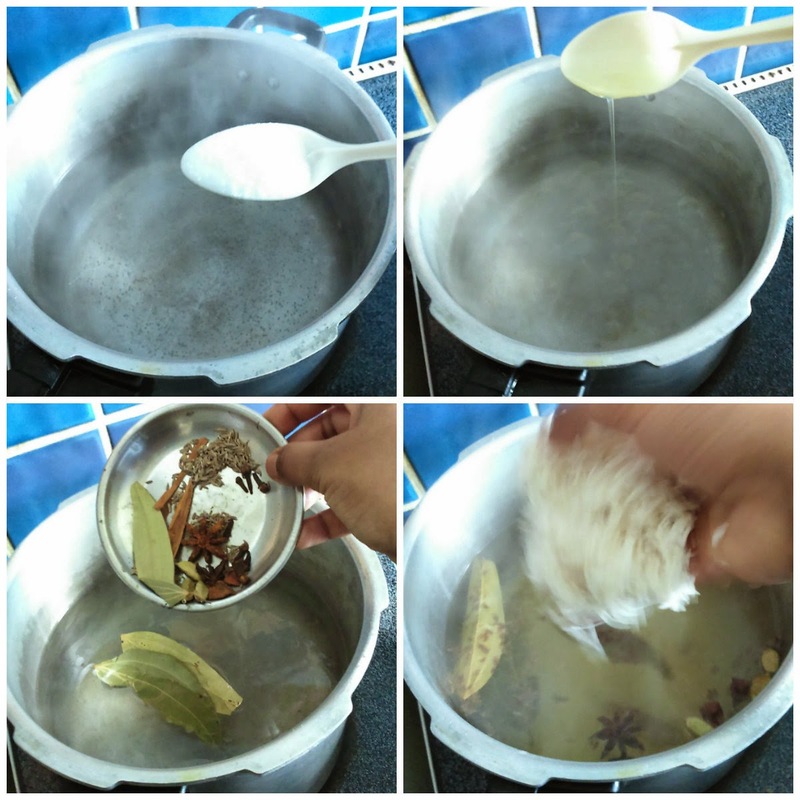 You can also sprinkle some rose water and kewra water which will make the rice very fragrant. Close the lid with a cloth inside and tie it as shown. Our basic idea is not to let the steam escape. The chicken and rice has to be cooked perfectly in the steam inside. Let it cook for 25 - 30 minutes on dum in very very low flame. Generally a roll of atta dough is kept on the edges of the vessel and closed tightly with the lid. But i prefer this method. The flame should be very minimum. If you are not able to lower it much.. after 10 minutes place an iron tawa on the stove and keep this vessel on the tawa. that heat is enough for the dum. 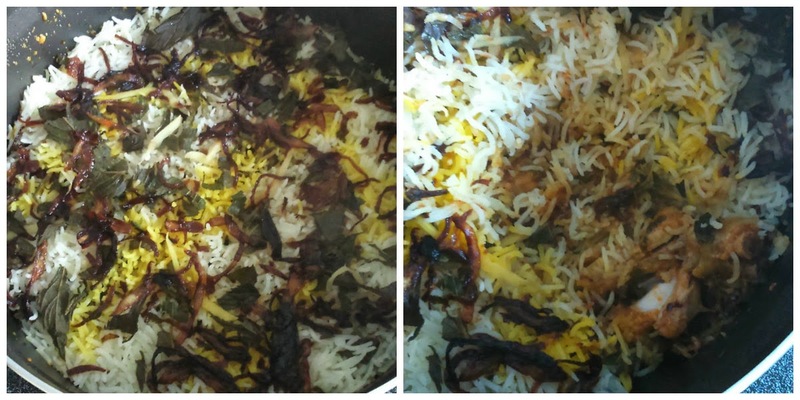 Open the lid after 25 minutes and temting flavorful biryani is ready. Check if the chicken s cooked. Squeeze lemon juice and garnish with some coriander leaves. Do not stir or mix well. Gently take the rice along with chicken and serve. Hope you enjoyed reading the recipe.. and give a try.. meet you soon with another wonderful recipe. Leave your comments and reach me @ pavithiravijay@gmail.com for any doubts or clarifications reg the recipe.